CNN had a story last week about the end of this year deadline the BRICS nations gave the US to reform the Bretton Woods system including the World Bank and the International Monetary Refund. The Bretton Woods Conference was held from the 1st to 22nd of July, 1944. It made the dollar the world’s reserve currency replacing gold and the British pound. The American representative was Harry Dexter White (Weiss). John Maynard Keynes represented Great Britain. Keynes wanted to solve the problem of nations with trade deficits by creating an international currency called the Bancor. He also wanted to levy fines on nations with perpetual trade surpluses. The American dollar was chosen to be the international reserve currency so if two nations wanted to buy and sell they would use the dollar which earned money for US Banks. The US was supposed to redeem all foreign dollar holdings for gold at $35 per ounce. The Conference set up a Development Bank that became the World Bank and a Stabilization Fund that became the International Monetary Fund. The World Bank was to always have an American President. That was true until July 1, 2012 when Dr Jim Yong Kim became President. Karen Hudes has documented corruption and abuses by American managers at the World Bank. We also have the 2004 John Perkins book Confessions of an Economic Hitman that reveal how Third World politicians were bribed into accepting huge loans from US AID and the World Bank that made their nations Debt Slaves to Wall Street. In an epilogue to the 2006 edition Perkins criticized debt forgiveness because it required they privatize public utilities like water, electricity, education and even health. We have also seen the US force aid recipients to allow Genetically Modified Organisms from Monsanto. In 2007 Perkins’ publisher published a book written by 12 journalists and investigators called A Game as Old as Empire: the Secret World of Economic Hit Men and the Web of Global Corruption. Bolivia is a case in point for water privatization. The American dominated World Bank required Bolivia to privatize water in order to receive a badly needed loan. The rise in water rates increased poverty in Bolivia and led to riots in Cochabamba. In South Africa hundreds of Africans died because they were cut off from clean water after privatization. More recently, Nestles had said that water is not some sort of right. Nestles owns Arrowhead which sells bottled water. Arrowhead is taking water out of the ground in a severe drought on an American Indian reservation and selling it to people who are not in danger of losing their crops and farm animals. The last three previous presidents of the World Bank were Jewish as were the last four Chairmen of the Federal Reserve. The man selected to replace the Americans as President of the World Bank was a Korean immigrant and a former President of Dartmouth. As a medical doctor, he ran a WHO project on AIDS. He is an American citizen. He is there to make the World Bank seem less corrupt. The IMF was to always have a European Managing Director. The IMF has an integrity hotline. But how credible is that hotline when the IMF has a front page article on the UK economy saying it is rebounding strongly? David Cameron has tried to ignite a second Housing Bubble by his absurd Help to Buy Scheme and by offering sanctuary to Hot Money from overseas criminals. Prosecute a few of those Financial Criminals from overseas and the price of homes in London would drop like a rock. London rents are making the city unlivable. Cameron is just trying to get past the 2015 elections. Will someone please tell David Cameron that the voters will be chasing him with the British version of tar and feathers because the BRICS alliance is just to pull the plug on the dollar and the pound? Richard Nixon reneged on the Bretton Woods Agreement on August 16, 1971 when he refused to redeem dollars held by foreign governments for gold at $35 an ounce. Since then American wages have been stagnant and declining. Gold has risen to over $1,300 an ounce. The reason for the continual trade deficit was twofold. America was a country blessed with natural resources. Wages were high compared to Europe so Americans had to use technology and skilled labor to produce an output capable of justifying high wages. That all came to an end after WW II when Wall Street began over populating America. When America’s population went past 150 million, she had to import raw materials for the first time. That meant American workers for the first time in history had to bid for lowering wages against foreign workers who routinely bought iron ore and coal from overseas and shipped back competitively priced cars. The other pressure on the trade deficit and hence on wages came from adventurism and militarism. Someone had to pay for all those troops overseas. 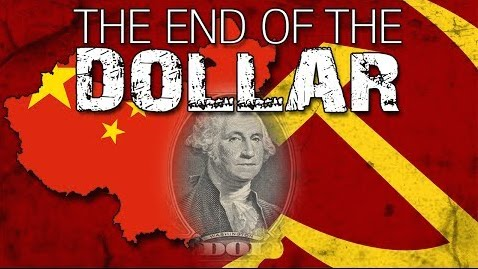 America just kept printing money which foreigners needed as a reserve currency to buy things from other countries even if the US had nothing they wanted to buy. Dr Hudson wrote Super Imperialism in 1972. He was asked to lecture at the State Department and at the Pentagon. When the Pentagon learned that America was financing its war and its occupations by printing IOU Nothing Federal Reserve Notes, an Army General said, ‘Wow. We’re ripping people off.’ He thought printing dollars to defraud foreigners was a good idea. In 1973 Henry Kissinger introduced the Petrodollar after the Arab-Israeli War. The Saudis and the Gulf States agreed to sell their oil only for US dollars. This meant Japan and Europe which had no need for dollars could use them to buy oil. That took care of America’s trade deficit. The Arab members of OPEC used their oil dollars to buy US Treasury bonds which took care of America’s budget deficit. The Fly in the Ointment was that Washington could never allow the price of oil drop below a price the Arabs needed to prop us the ailing dollar and fund US budget deficits. It is now five years after that first June 2009 BRICS meeting which demanded a limit to America’s military presence in Central Asia and fairer treatment of nations required to do business in the dollar. The BRICS nations apparently told CNN that if America does not reform their Bretton Woods system which includes the World Bank and the IMF that there will be consequences to be felt in 2015. China has always taken a very cautious approach which means we ought to heed their ultimatum. It is not a bluff. America is broke and cannot afford to pay the consequences. America has lived for years on the charity of others. The power elite of Wall Street declared war on America long ago. They deliberately overpopulated America. One reason they killed President Kennedy was that they wanted to get Americans into a protracted land war in Asia so they could infect the younger generation with defeatism and hook them on drugs. They had given north Korea to Joe Stalin because they wanted to break America’s spirit. They passed NAFTA because they wanted to deindustrialize America and lower wages so they could turn a Once Proud People into Debt Slaves. On 9-11-2001 they blew up World Trade Center Towers 1, 2 and 7 with controlled demolitions to announce to the world that they had the Power to attack the United States and to tell the lies we must believe. No security clearance and no job for you because you don’t believe our lies. WTC 7 was a 47 story building. It was never hit by a plane. It had a few fires earlier in the day when debris from an nearby building struck it. Yet it fell straight down in 6.5 seconds. It had 40,000 tons (36,287 metric tons) of steel. It had 84 steel girder columns. Each floor was connected at those 84 points. To fall straight down all 84 connection points between the floor and the steel girders had to be severed at the same time. There were 47 times 84 or 3,948 connection points that had to be severed at the same approximate time. Otherwise the Towers would have fallen over at an angle. I should point out that if you see the videos of the Towers collapsing you will not see melted windows. Wouldn’t you expect the glass to melt before the steel? Steel does not melt until 2,800 degrees (1,537.8 celsius). The other oddity about WTC 7 was that BBC announced its collapse 22 minutes before it did fall down. The Rothschild owned Reuters news agency told the BBC long before it did collapse that it had collapsed. How did the Rothschilds know that Tower 7 was coming down? Tower 7 had secure government offices and no Muslim terrorists were permitted inside the Tower on 9-11 to set demolition charges. 911 was a public announcement that the elite used to show their contempt for Americans. Wall Street’s Dollar Imperialism system is incapable of reform. It is heading towards a crash sometime just before or after New Years Day 2015 when we encounter the BRICS Brick Wall Ultimatum of No More. The Chinese and the Russians are making deals right and left including NATO countries like Germany and Great Britain which avoid the US dollar. The BRICS alliance has set up alternatives for the IMF and the World Bank. China holds monthly ministerial meetings with the Saudis The BRICS nations have set up alternative work arounds for all those financial sanctions Washington imposed. Early 2015 is as good a time as any for the Dollar to Die. The US infrastructure is continuing to collapse. The US has 1.2 million homeless school children that it does not care enough to do anything for. Plenty of money for supplemental appropriations for Israel. Not a penny for the thousands of Detroit residents who are losing their water. But as Nestles explained, you do not have a fundamental right to drink water. Obama is placing a tremendous financial burden on local and state governments. The Sheriff of Butler county Ohio said one third of the children born in his county near Cincinnati are born to illegal aliens. In 2000 less than 2% of the people in Butler county were Latinos. That is a tremendous population shift. That is also a tremendous burden to place on local healthcare, welfare and educational systems. It is designed to bankrupt them. I believe Obama is using Amnesty to kill America as a nation. BRICS could attack the Petrodollar by joining with OPEC to price oil in currencies other than the dollar. They could accelerate the dumping of the US dollar and the sale of US Treasury bonds. They could use the dumped dollars to buy gold and silver bullion, farm land and undervalued stocks. The point is that America is so weak that any push will send America and Britain off a cliff. As Professor Steve Keen said, we have more Unpayable Debt to cancel than anytime in 500 years so we are headed to the worst Financial Crisis in five centuries.